Cardinal Copia has a lot to prove. 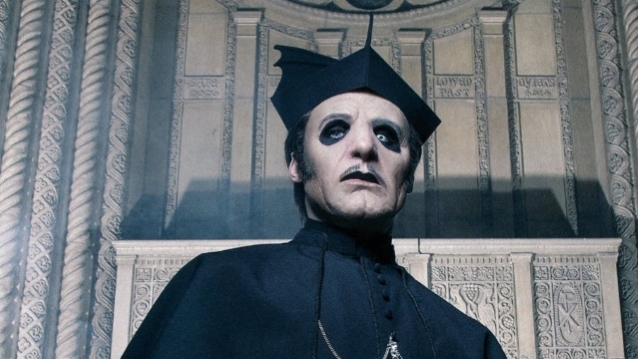 He doesn’t have the blood of a pope, but as the newest bandleader for Satanic rockers Ghost, he’s got youth and “sexual charisma,” according to the clergy. The church needs that: all of Copia’s predecessors are dead. Papas Emeritus I, II and III were assassinated and embalmed earlier this year. The snappy-dressing, jukebox-carrying cardinal’s their only hope. Until the next album. You can watch the playfully dark succession story unfold on YouTube, used this time to hype Prequelle, Ghost’s fourth LP. Behind each newly appointed skull-faced preacher is actually the same guy. A fan of history, heavy metal and the 1980s, Tobias Forge is Ghost, the next in a lineage of Grammy-winning rock bands who wear costumes and sing about the devil. Backed by masked musicians called Nameless Ghouls, and the oldest of the fictional popes, the saxophonist Papa Nihil, Ghost makes a tour stop at the Community Center Theater on November 15. Can the band please the clergy, or at least Sacramentans who grew up on Ozzy Osbourne, Alice Cooper and Judas Priest? Because that’s exactly who this music is for. Listen to Prequelle’s “Dance Macabre,” an arena rock love anthem sewn as a dark party for the dead, and you’ll see what I mean: It’s a nostalgia trip to that bygone marriage of glam and horror, with reverb-heavy drums, triumphant keys, layered vocal melodies, power-metal riffs and a wanting guitar solo. And similar to bands like Iron Maiden, Ghost pulls from history for contemporary commentary: The song “Rats” retells the Black Plague, so in this case the 14th century. Wonder who they’re calling out? Are you a big history buff? I’m not a historian. I’m interested in history. It’s a lot of ground to cover if you look at it from a worldwide basis, but try me. There are a lot of historical parallels being drawn right now. To the Cold War. To World War I and II. What’s Prequelle about, and how are you pulling from history here? The main concept is mortality … Acknowledging the fact that you can persevere so far, but as far we know, you’re likely to succumb to some sort of ending. … And I think from an apocalyptic perspective … that has been preached and prophesized many, many times. Civilizations have come and gone. And new ones arose at the expense of others. … It’s easy to think of humanity as very complicated, but at the end of the day, it’s very simple. We’re not that smart. We move in groups. And we tend to do the same things over and over again. Are you responding to any recent historical cycles you’ve observed? Well, politically, in terms of the Cold War, there’s a lot of things … You have a little bit of Watergating here, you have a little bit of the crisis of the mid 1900s going on. We still have huge countries against each other. I’m talking about Russia and America, and me as a European, we’re sort of sitting in between, which is not very different than how it was in the ’50s … But from a worldwide perspective, I also think that there are enough people in the world who don’t want it all to go away permanently … I want to believe that we will be able to look back on this 50 years from now as one of those weird points in history when things were a little bit rocky. But then 50 years from now, there will be something else. How do you see your role, being a popular musician playing apocalyptic music? I am an entertainer. I am here to make you feel potentially a little bit better about the world, and in your every day-to-day life. … I guess a lot of the entertainment I’m into, especially when It comes to rock, has some sort of social take, commenting on the contemporary state of the world, especially in the ’60s, the ’70s … But I don’t have higher hopes than that in terms of Ghost’s relevance to what is going on. I don’t think we’re changing a whole lot. But I think we can probably be a little bit of a band aid for anyone who likes Ghost and what we and we’re doing. Hopefully [we] can be a pillow to squeeze if the times feel rough. In the ’80s, artists like Judas Priest and Ozzy Osbourne were known for incorporating Satanic themes, and upsetting Christians. But that was 40 years ago. Are there any ways that you’re music has offended people, that surprised you? I think that I have been personally more subjected to people who have said the opposite. Just coming from a traditionally more conservative background, and then being surprised that they are oddly in favor of what Ghost is doing. Maybe not 100 percent from a philosophical point of view, whatever that means, but it still resonates in a positive way among people who would traditionally not like “satanic rock music.” … I have theories about it, but I don’t know, maybe it’s just the fact that heavy metal in the 1980s was way more of a household thing, and the gap between generations was bigger at that point, so you’d have the 15 to 25-year-old teenagers in 1980 or 1985. Their parents would have been 40 or 50 at that point, and were potentially of a different breed than most of the 40 year olds, 50 year olds, 60 year olds today. … But it all depends on how you present yourself as a spokesperson for a band like this. I’m not here to shock people who are not willing to be shocked, if that makes sense. I’m not here to throw a grenade into the god-fearing home, trying to rip your family apart … I want them to come to the show and have fun and feel good about themselves, and want to live their lives … not to commit suicide or go kill someone. I want people to be happy and embrace life. … I can imagine Rob Halford [of Judas Priest] having never said anything unlike what I just said, nor Ozzy Osbourne. From a strictly Christian point of view, if that means believing in a physical, half man, half-ram living in the underground, no, I don’t believe there is such a thing. I’m not the opposite either. … And you know, I’m sure in the eyes of the beholder, if I was put in front of true god-fearing bible thumpers, I would probably be regarded as a Satanist … just because I’m not a god-fearing bible thumper. But the concept of Satanism has many, many forms … In the last 50 years now, ever since [Anton] LaVey and pop-cultural Satanism, when that rose in the latter of the part of ’60s with the Church of Satan, and Black Sabbath and Black Widow and Coven and that sort of hippie Satanism, which at the end of the day, heavy metal, black metal, all that is based upon that cultural Satanism. … I grew up with that. … So from that point of view, I would definitely say that culturally, I am definitely, for lack of better way of putting it, I’m a devil-liking kind of guy. But … I wouldn’t sacrifice a baby to a half-ram that I believe to be living in the underground. … And I would never ever encourage anyone to do that. Oh good. In an interview with Revolver magazine, you likened Ghost to procreating with rock history. What has Ghost meant to you? Obviously, it’s meant the world … Not only am I myself depending on it, but I have two kids depending on it. I have a wife who’s depending on it. I have around 30 people around me living on this. So obviously it has a great feel of significance for me … It’s very much reliving a lot of the things that I did as a kid, when I dressed up as KISS and Alice Cooper, and watched horror films. It’s very much reconnecting with a lot of the things I grew up with. It’s very childish. In a regurgitating kind of way. I guess so, I’m not involving myself as a child in that, so don’t go incestuous or weird here. (Laughs.) I’m definitely wallowing in my past. I’m very much a typical kid who grew up in the ’80s. Just because I had a brother who was older than I … I got a lot of teenage culture from him at an early age. I’m definitely wallowing in that. If I would meet myself in 1985, you can compare the things I’m interested in, and not a whole lot has happened, really. I’m searching to recreate myself as a five-year-old with my brother. That feels important.